In today’s fast-changing environment and in the age of disruption, organization’s business models are not durable enough to manage change. Most change in business model is driven by the change in customer journey that drives changes in organization capabilities. The traditional approach of developing strategies are not suitable in the age of disruption. 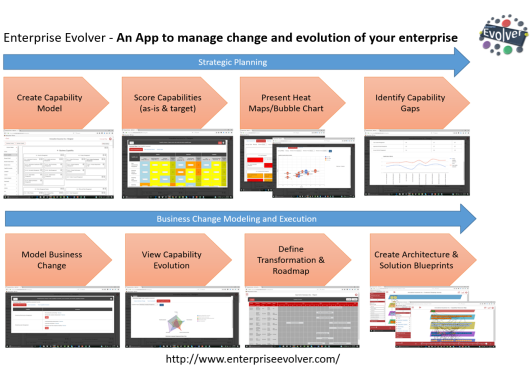 Enterprise Evolver (“Evolver”) supports Capability Based Planning (CBP) and business change modeling framework to help manage business change and innovation. A Capability Based Planning (CBP) is required to enable something new or transform something which is innovative and important for customers. Create Capability Model – Business Capability describes what the business does and can do and what it will need to do differently in response to strategic challenges and opportunities. This capability is delivered through the right combination of processes, people, skills, technology, and culture. In an organization, we have resources and capabilities are what you can do with the resources and the competencies are those distinctive capabilities that you do well that put you ahead of your competition. Product and services are the results or manifestation of capabilities. A business capability model is created to represent the essence of the business and to show what capabilities exist and what are missing. In Evolver, select the Business Capability category and then right click to use the context menu. 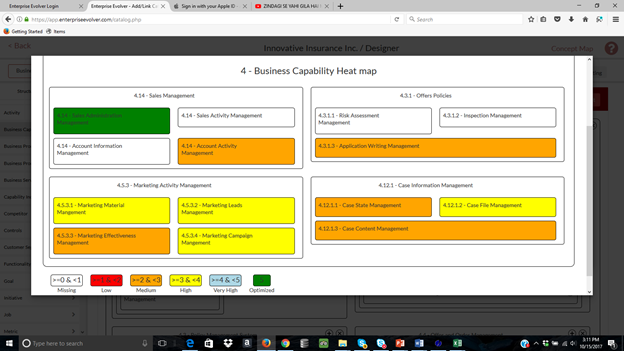 Select the Capability Management option and then select the Maintain Capability Model option to capture your organization capabilities quickly. 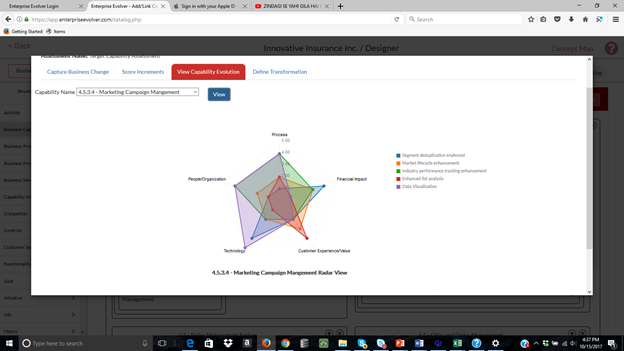 Score Capabilities – Evolver helps you to analyze capabilities from all essential aspects of the business aka dimensions (e.g. process, people, technology, complexity and culture etc.) that impact the capability. The analysis helps you to focus on that part of the business that needs to be fixed or improved. 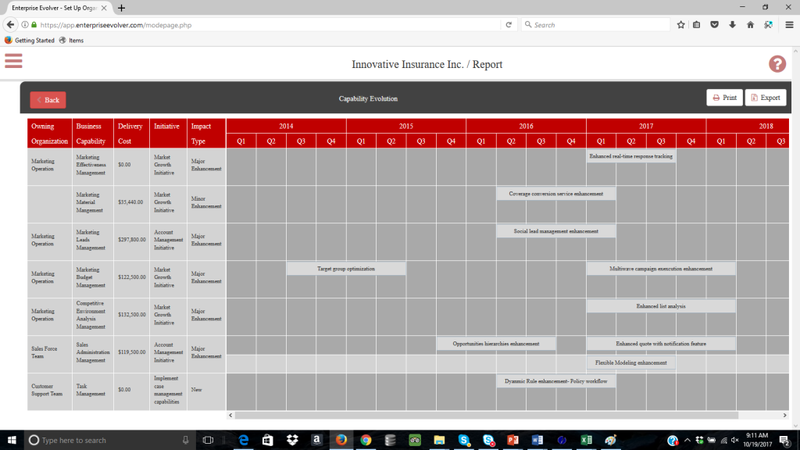 Capability maturity scorecard can be created for current and future state. Present Analysis Result – Evolver automatically generates capability heatmap highlighting weakness in current capabilities. The bubble chart can be used to analyze the capability from many dimensions (e.g. maturity, complexity and Strategic importance etc.). The color-coded information in heat maps can be used for planning and funding activities after identifying the weak capabilities. Identify Capability Gaps- In this step, we identify the gaps that the business needs to fulfill in order to achieve the strategic goals. Evolver allows you to compare current state capability scores with the future state scores or you can simply compare your capabilities with that of your competitor’s capabilities. Multiple assessments can be compared; a graph is generated which helps management to identify the degree of change in each of the selected capabilities. The gap analysis reports help management to identify those capabilities which are needed to be improved or transformed. Some of these improvements can be minor and some could be a major enhancement as well. The larger gap between the graphs of the two states of the same capability can be understood as a major enhancement and a small gap can be understood as a minor gap. Develop credible options for capability improvement. 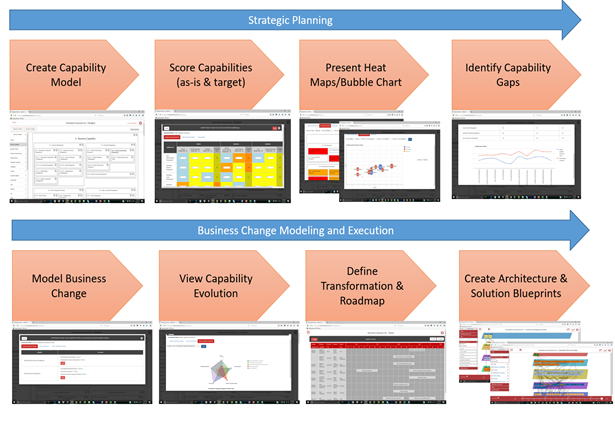 2. Business Change Modeling and Execution – In this step, we model changes in the prioritized capabilities. This step must be performed only after when it is understood which capabilities require attention or need to be developed and the strategic planning process is completed. Model Business Change – In this step, capability increments are defined to capture changes needed for each prioritized capability. An improvement in a capability is accomplished by creating the defined number of increments. Business Architects should work with the management and product managers/owners to define each increment and the outcome that each increment will deliver. Each increment can also be considered a group of features that the product owner is envisioning to build in a given release. We use these increment to document the changes in the capability. Each capability increment can also be considered a particular version of the capability or a particular state of the capability at a certain point in time. 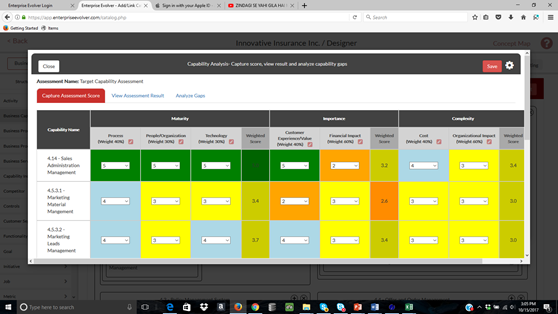 View Capability Evolution- To emphasize which dimension of the capability increment will be prioritized, we provide a score to each dimension. A higher indicator value (e.g. 4 or 5) for process dimension for an increment indicates that the improvement in the process dimension is important for the stakeholders. A lower indicator value for a dimension indicates that this dimension is not much of the importance to the stakeholders. 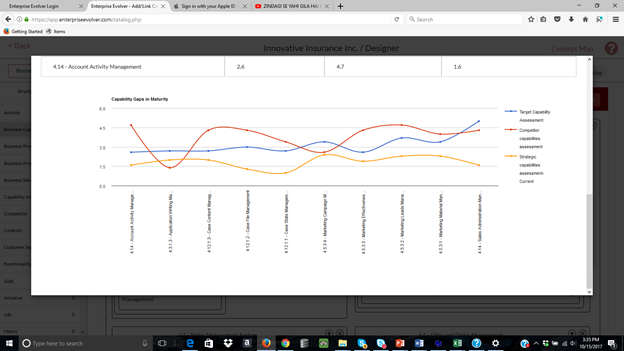 The higher indicator’s value also helps understand the stakeholders in what sequence capability dimensions will be improved. In each increment, various dimensions (e.g. skills, technology, process, data, and technology etc.) are identified that need to be improved, for example in one increment, you can focus more on the process dimension. A radar diagram is generated to depict how the capability will evolve via various increments. These diagrams also help stakeholders to understand the order of dimensions in which the performance of the capability will be improved. The organization will know what dimension will be improved first and then the next and so on so. Define Transformation and Roadmap- In this step, we define the transformation initiative for the capability development. 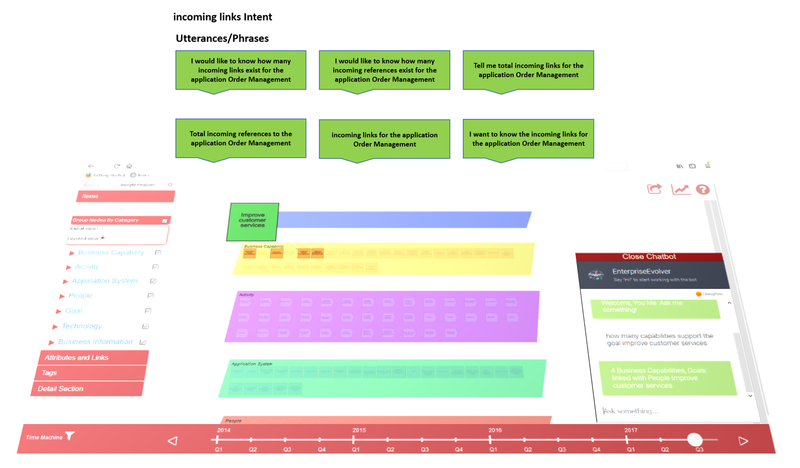 In each initiative, the impacted capabilities are included; capability increments are added; capability timeline is captured; resources are leveraged and outcomes and high level business requirements are captured. 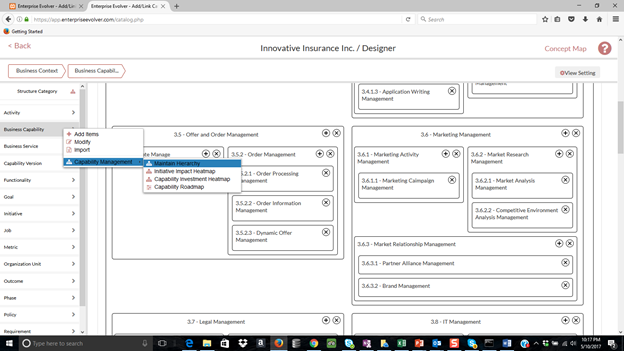 The deliverable of this step is a capability roadmap and a business case document. 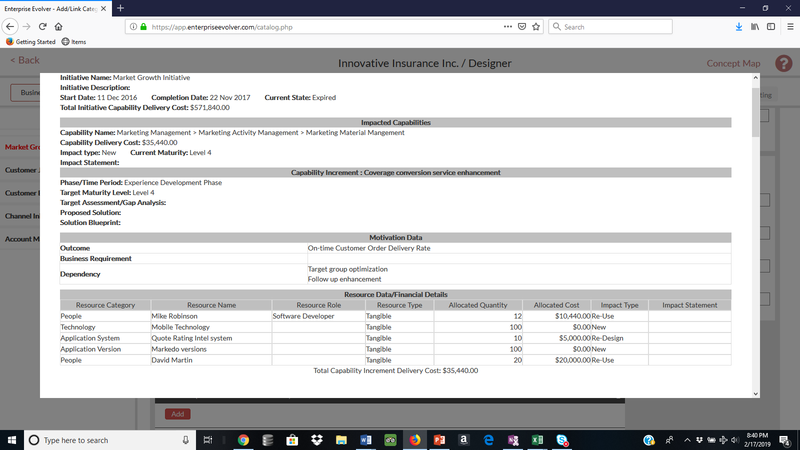 Evolver automatically calculates the cost of delivery of each increment and provides the roll-up cost of each capability and the initiatives from the resource’s cost. 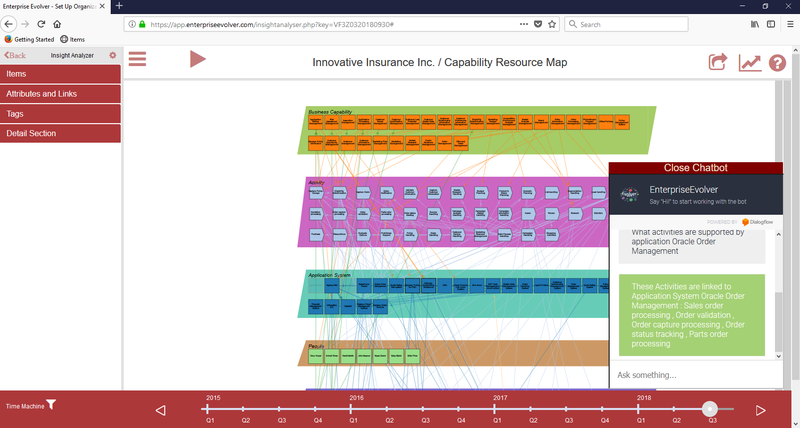 The Capability Evolution report provides a good way to visualize how capabilities will be improved via capability increments including the cost of the capability improvement. 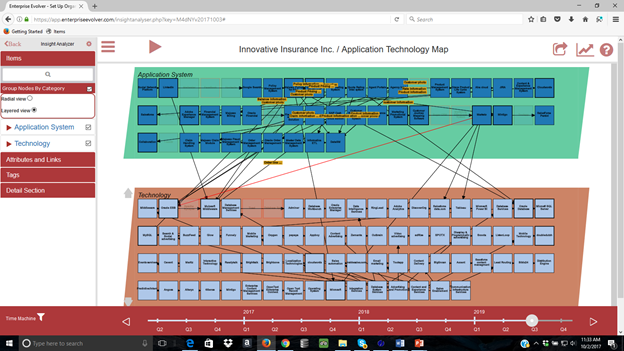 Create Architecture and Solution Blueprints – Finally, we develop the architecture to support the capability transformation initiatives. The Designer module is used to capture the architecture and through Coherence Dashboard and Insight Analyzer, the architecture and blueprints can be graphically visualized and analyzed. 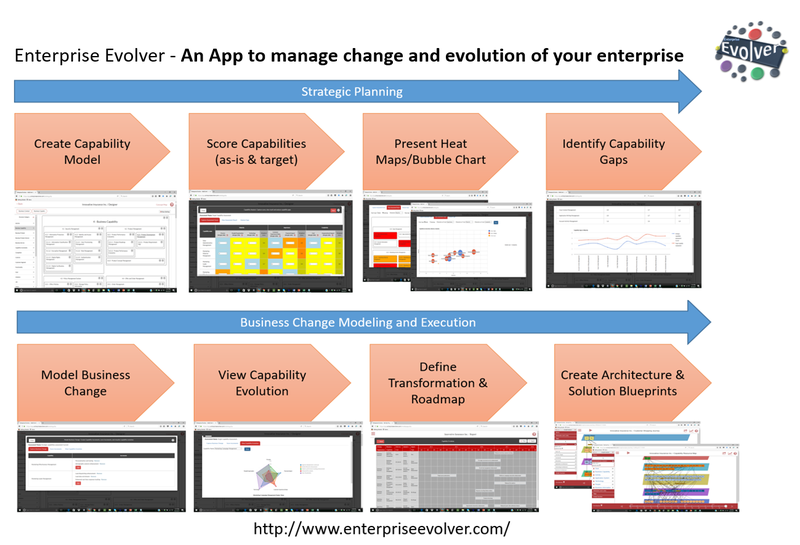 Enterprise Evolver is a tool for you in the Cloud to help you start your Capability Improvement journey quickly! Develop your strategy actionable and capability driven. Watch this short video.